Liam, or anyone , have you a pic, dwg of a deck construction under a dome, bell, flared or otherwise, seems to my way thinking you would neeed to strip plank in a double diagonal fashion? And yes Rathcheck is great! Here is a video I though you would all like. I got it from NA Bocker. They don't sell these any more but the own AGZ has crated his own. I use one at a trade show where I happen to have a 1" thick psc of slate it my booth and his cutter cut it. The ones I have are limited to about 1/2 to 3/8. 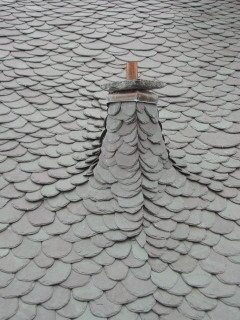 That is some pretty wilde slating.It is nice when the customer has the capital to allow you to lay a beauty of a roof like that. Here's a picture from up high. Where to go nexts? I sent you a email, check it out when you have a minute. Here we go the slate is done. 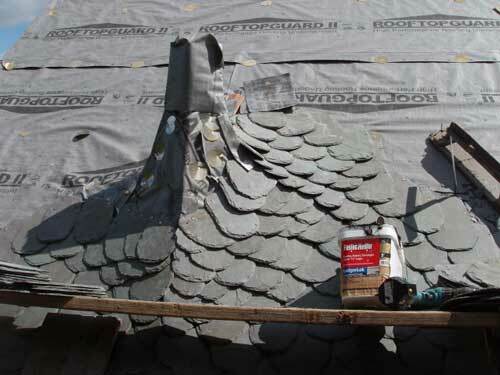 Wild slate roof covering. Here are some new updated pictures. 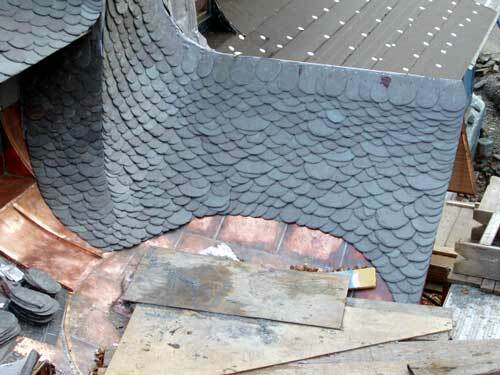 we will be re-slating a steeple spire and two turrets. approximately 25 sq., with clipped corners and l,500 lineal foot of angle cut ridge. I would prefer to clip the corners with my ground help. The cost of having the quarry do the work could be offset with the leyen-cut. It will also take up the idle time of the ground men. I would push NA Bocker to do there job and get one. What do you need it for? There a different company in the mid-west that sells Freund tools. American Master Gutters they may be able to help. I am in need of a Leyen-Cut. N.A Bocker does not have one or expect to have any in the near future. Anyone know of a source for a new or used one? If there is another cutter which would work equally well I'd be open to that. Here are some other nice picture of the roof. The toilent vent, needs apcs replaced at the bottom to be complete it. This is just wild. What else is there to say. Just follow the pattern Ha Ha. Well so far I have lay about 80 to 90 % of the roof. I have a few other workers that are mostly on other job, but will help me when we have a opening. There was about a total of two guy 5 to 6 week of cutting the slate. 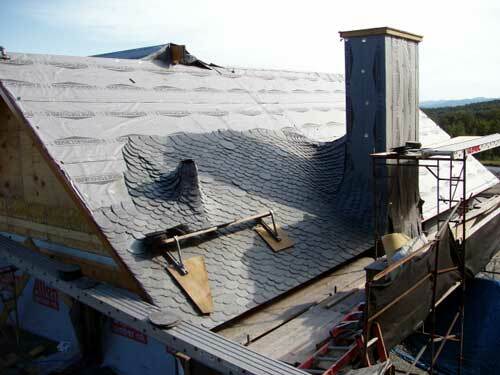 About 1/3 of what has been cut will be custom cut again in some way to fix the different details on the slate roof. There is also copper details that are inside, I will post them late, when there done. I may get to do some cedar shakes, to fill the time. There is alot of dowm time, waiting for carpentry's so I end up doing alot of that T/M. My T/M bill will be about half the cost of the contracted price of the job. The slate cap is for the most part siting there by itself, beside a small amount of silicone that was recomendend by the mason on site. 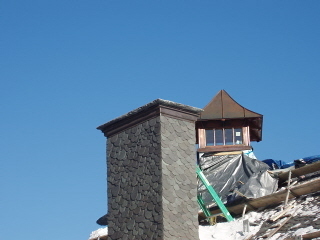 The flue come up throw the slate so there really isn't any way it can move. I will be doing a few other details with big pcs of slate, one is done, there is a few other one that are going to blow you away. I will try and finish them soon. 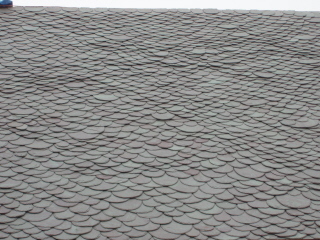 Are you doing the shingled siding to? Thats a real beauty. How big of a crew did you have helping you on it, or was it a total solo project? That looks like a ton of work for one man. How did you secure that chase-cap? Well just to let you know there is a 3 foot perimiter of ice and water on all the roof and up the valley's. I don't think that it is going keeping the water out for ever, but if I had only used 30lb felt, I would have had to replace it. 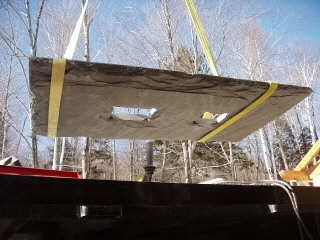 (We did have to install 30lb felt on a lower roof that had those SSpanel per company specs. 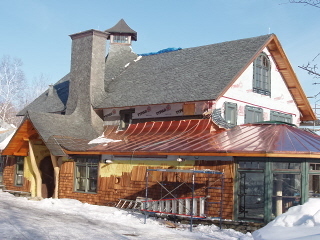 Its been paper 3 times, and know has 20oz standing seam copper.) This june will be a year that I have been on this job, with one snowy winter. Paper wouldn't of held up, and also most of the inside is now done. 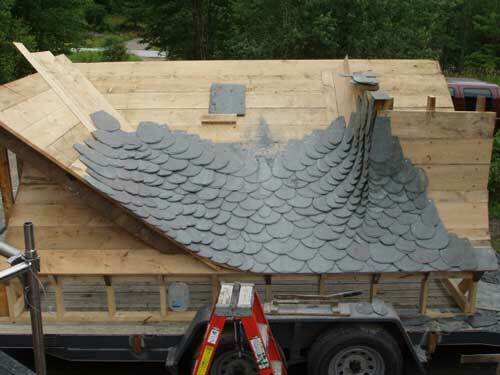 I feel better at nigth to know that some tempered underlayment isn't getting ripped of by some high wind storm with t-shower after that soaking the finished inside before every getting the slate roof done. Know I now that the ice and water will maybe last 20 years under a slate roof. I have done work on a house that is know 6 years old with new slate installation with ice and water under it. We had to take areas of to fide different problems. All the ice and water was crack up and or cut up from the slate installation. (That is why you should cover any ice and water with some kind of felt paper or other under layment. This will help to pertect that from most of that to get more years out of it.) 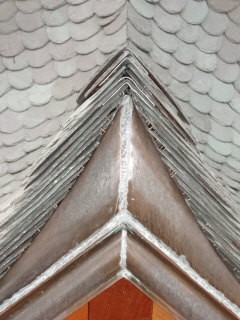 Also who ever did the job use ice and waster as miter hip flashing, which should of been copper. In this area the ice and water had started to fail from the sun getting through the miterd edge. So, I know from my own eye that the installiton of a under layment is only temparary produced mostly to get the roof done. Here a up-date on are project here in Vermont. Its really coming together, can't wait to show some other details that aren't very common. 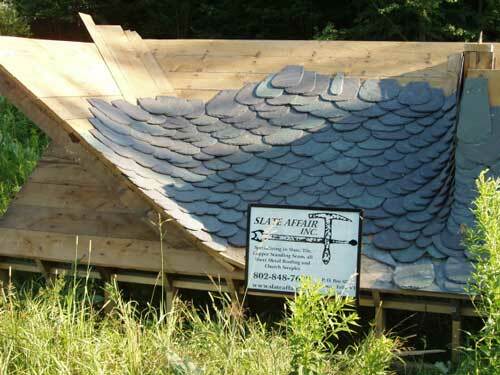 Its not a roof, but it shows how you can use slate in many ways. This cap is 7 feet long x 4 feet wide x 2.5in/3in thick. I had to cut it two size and the flue holes with a masonary saw blade. I also used a electric chisel hammer to finish of the two flue areas. 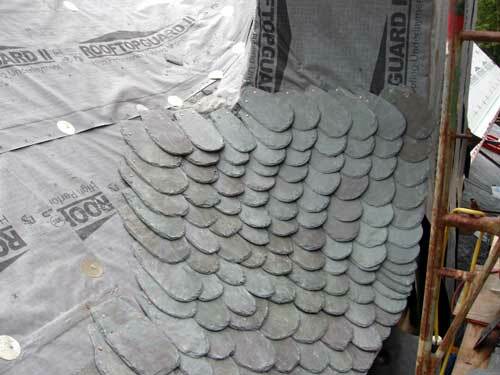 I use a hammer and hand ozel to finish the four edges to make it look like a big pcs of slate. 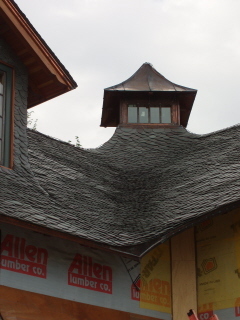 It really ties the whole roof and chimney together. This house was made in Wilde Deckung,too. I have a Roll Former VS-150 them come with Camber Rolls for straighting panel. 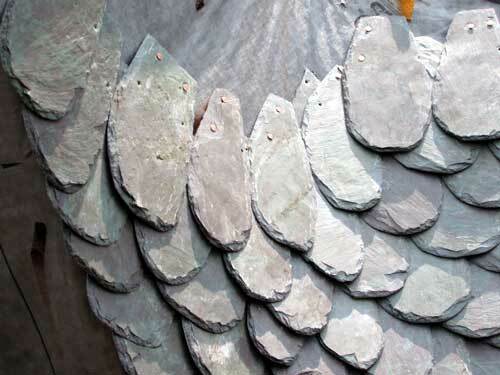 Which can also curve the panels, you will get a very small amount of kinking on the male rib. The female rib comes out fine. Schlebach another great panformer, I had in a different company has a attachment for there Quadro-Plus Panformer which make only concave curves but with out any kinks. They also cost about 3 time as much as a Rollformer. Liam, what type of panformer do you use that does the arch as well? That is correct, I use the shrinking tool to do the concave bends of the cupola. I would only used the stretchers on this if I over shrunk any thing. I then use a seaming iron to close the seam. I also have a panformer for standing seam that can do the same thing. For convex and concave bends. The differents is the panformer is forming the rib of the panel before it goes through a few wheels that cause it to curve up or down depending on what you want. With the cupola the panel start as u-panel. I know I've asked you this before (at the workshop this past summer), but to do the upstand edge on those concave-up curves on the edges of the cupola (as well as on barrel-vault convex-up curves) .... those little shrinker-stretcher "jawed vise" tools allow you to do that right? 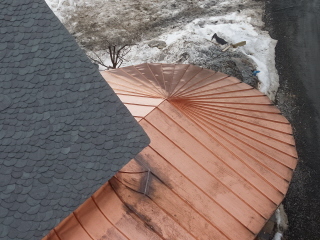 Here we lift up the cupola with are crane and my area I tarp in for the winter know I will work on mostly copper standing seam detail on the lower roofs till the snow brakes. Have you finished this project yet? Anymore pics? You inspired me to try a similar style on a mock-up I'm working on for an expo here in CA. I'll post some pics when I'm done with the whole thing. Keep up the great work. 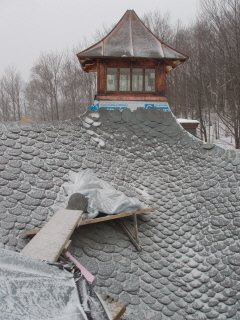 Here Ron, this is what we do every winter to keep working on slate, this project is in the Green Mountains. 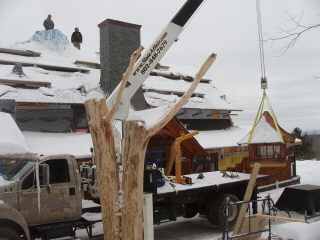 There is about 3 feet of snow there already, the project gets what we call Mountain Snowfall. I also heat the tent. The next area is alot bigger and will post a few pictures later. 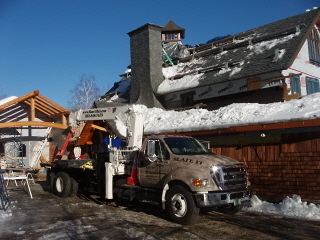 Here is a little bit of winter work for us Vermonter. Liam that is to much...I showed it to my wife & daughter now they want something similiar on a section of our roof(Thanks alot(ha)).Really a great roof..How's the weather up North,we missed all of this week now have to wait for the thaw..Take care & sharpen your cutters! The wild world we live in, round , but flat. 3/4 square takes about a day to install. The slate are 12" tall random. 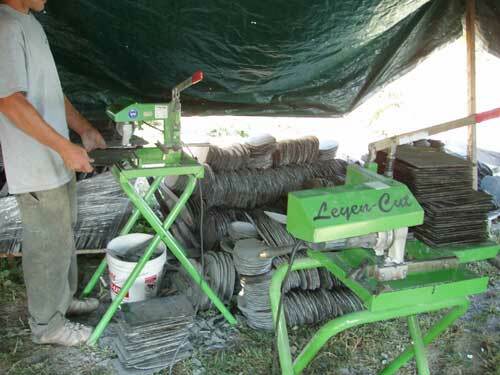 A person can cut about 2 sq depending on the size a day, and this is with the Lenyen-cut slate cutter. We are installing lead in valley ares under the courses. We are also using Bull Dog red slaters cement under almost every pcs, mostly in valley's,the perimiter, and all slate that end up get punched up higher on the slate. Hey Liam, Wow--Looks good - A little labor intensive--How many man hours to cut and install 1 square on an open area? You might be done by the next SRCA meeting(ha)... Good Luck Hope all is well. This is about 7 days (10hr days) of work laying slate for one guy, and I have one man cutting on the ground all the time! Here is the start of my project. I had also buy a Leyen-cut power slate cutter to help in cutting the slate. I found for the money that the Leyen-cut power cutter is way better then the Primero powered slate cutter. 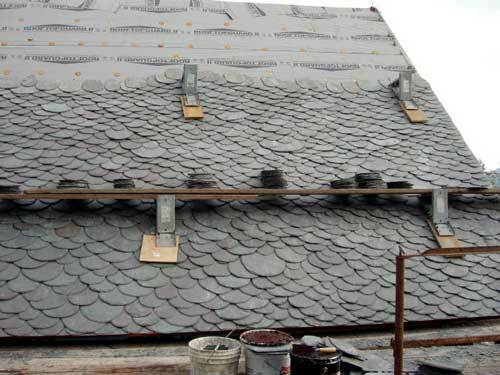 If you are going to cut alot of slate you should go with the Leyen-cut. I found the Leyen-cut to work so good that I have order a second Leyen-cut to speed up the cutting. Very little slate brakes when using both cutters. Thanks Michael for the info, all of the site /houses I have also found on different links or sites. My model was done with hand cutters / (I made my own) slaters stake. I plan on mostly using the power cutters for makeing pcs in area that the slate is for the most the same size(Sides of dormer and valleys etc.). 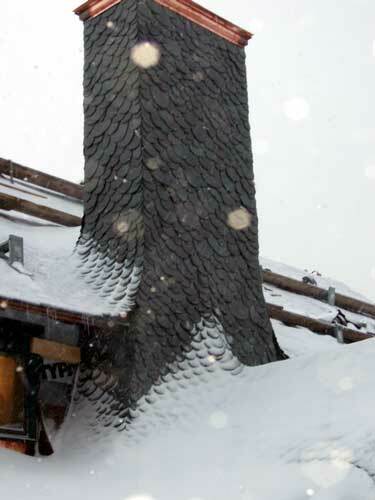 There is one in Aspen, but more of a jagged look. I don't have any pictures, lost them in 2003. But here are some cool links. I think you are doing a great job. If you could master to cut and punch slate using a hammer, it would speed up the cutting prossec and makes it easy to cut slate on location. I have never used the power cutter and never met someone who used them. Rathscheck sells there own brand, but sais it is only for cutting trim peaces in valleys and such, not for massive cutting. Michael do you have any picture of your Wilde Deckung projects? Its hard to surf germany sites with my german / english dictionary. 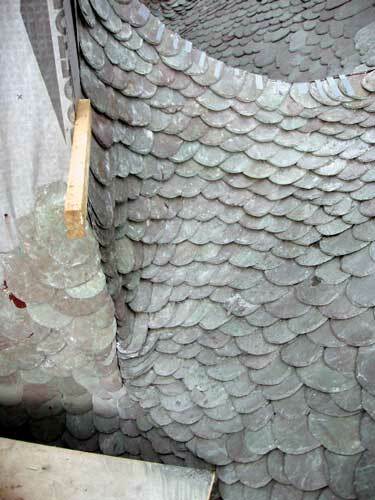 You can get slate, specially for wilde deckung in Germany were you need just to cut the round exposed part and punch the holes. Bringing in tile from Europe I can tell you that shipping is not as bad as it might seams. There is also a blade for a jigsaw available for cutting slate, however I was not impressed with it. I was introduced to the slate guitines here in the States and just can�t cut with them. Never used a power cutter, so that might be the answer. 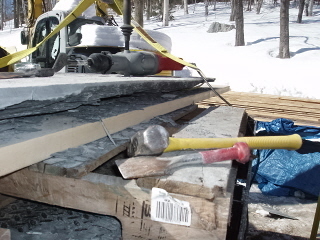 So far I am the most accurate and fastest cutting slate with the hammer. 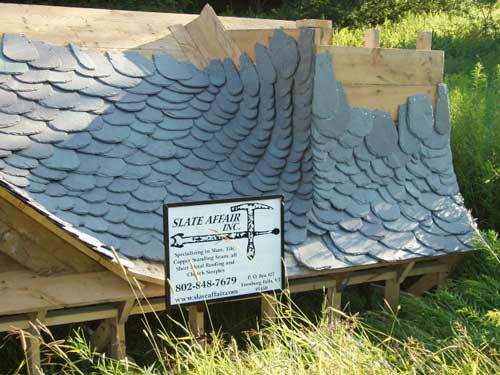 There are tons of different styles of slate hammer out there. The Rheinland hammer made by Picard does it for me, some people like the Saxon hammer or the French slate hammer. For heavy stone the Meister hammer would be good, there is even a slate anvils with hole punch, you just hit a pin that punches the hole. Check out some of this links. Wilde Deckung, Wilde means just wild and deckung means covering. 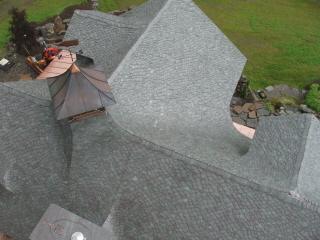 In this case roof covering, wild slate roof. I did mostly Deutsche Schiefer Deckung and was lucky to do a few Alt Deutsche Schiefer Deckungen were also every stone has to be cut and it was done by hand. You will find a lot info on Rathscheck website. I believe I got a link to them from my website. I realy would not say you did anything wrong. I just did learn in roofing school the stone should be tappered, yes you get more lap, however more tapper brings the sitelap to more of an anlge and water runs more away from the lap than running along the edge. The water has a harder time going pass a sharp edge than a bevelt edge, therefor the sharp site out. In school they were critical of those things and they overdid it sometimes, my Meister out in the field just wanted the job done and watertight. I was interested in the Leyen cutter. 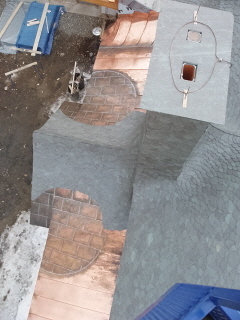 I just have to many tile roofs and copper work going on at this time. Not much slate going on here in colorado. I have one power cutter and the other is onits way. The one I have is the Primero-Carver and work Ok. I clamp it up side down to a table and it seem to work better to hold the slate. Not the tool! I will get the Leyen-cut soon and will let you know. From what I have got off Germany site is that untrimmed pcs should be used to create the sharp edge on the slate and then you just trim the exsposed part. I was going to cut my pcs to a point but want as much side and head lap as I can get. Should I not do that? Should I have that sharp cut on the upper side? What about the the name Wilde Deckung I have the under standing that it means savage reimbursement or savage gold backing? Is that rigth? Thanks for your input Michael. I did a simular model like yours. 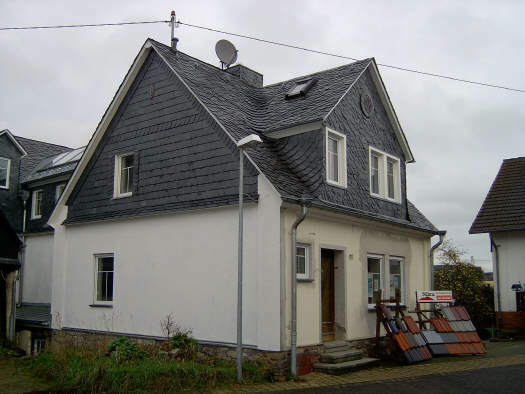 Did many slate roofs in Germany, my home. I am roofing since 78 and came to the US in 91. I did cut the slate allways with a slate hammer and a round slate stake. Wished I would had a power cutter when I was 15, as a apprentice I had to cut the slate sometimes for month, for the journeymen. Would be interested to know how the power cutter worked for you and what brand you used. One thing I did with wilde deckung was, to cut the covered part of the stone from the front, so you have a sharp edge outwards and therefore a water stop. The exposed round part cut from the back of course. I also had the stone tappered to a point. But that is what wilde schieferdeckung is all about, everyone gives this style his own signuture. Thanks Ron, I do have two power cutters on order. There is about 14 hr in just slateing this model, that is with a hand cutter. Hey Liam looks good ,I think you have it under control....but I really do not know what I am looking at!.....Only thing I could add is buy a new slate cutter,40 square, yikes thats alot of cutting,I would consider a power cutter..Good Luck. Well I like some input, if there is any, here is some more. I have about 40 sq to do so if any one has something to say the sooner the better. Or you will all have to wait and see there this one goes. This was a model and was broken on the bottom, in moveing it back to the shop. That is why I put the sign there. Well if there is any one how has installed this style before please post some pictures.